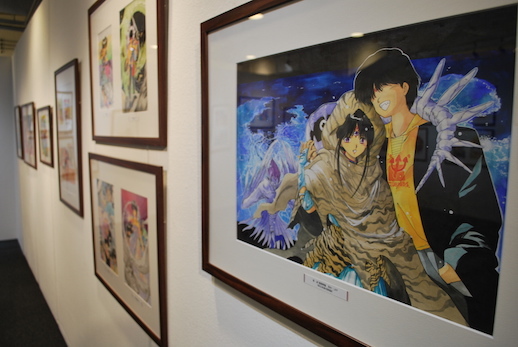 The supernatural adventure manga ‘3×3 Eyes’ celebrates its 30th anniversary with an exhibition in Ikebukuro. In 1987, the year that JoJo began his bizarre adventure and Junji Ito unleashed ‘Tomie’ on the world, readers of Young Magazine in Japan got their first taste of Yuzo Takada’s supernatural manga “3×3 Eyes.” Its unique mix of action, horror, comedy, myth and mysticism ensured it was a breakthrough hit for Takada, and the series was duly awarded a Kodansha Manga Award in 1993. After ending its original run in 2002, ‘3×3 Eyes’ came back with a mini-series in 2009 and officially restarted serialization in 2014. 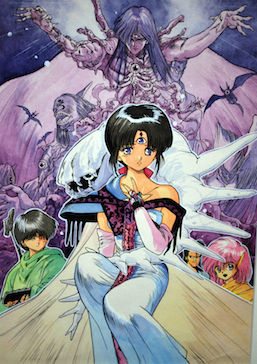 As both its illustrator and writer, Takada has been single-handedly responsible for the long-running story arc and numerous adaptations of ‘3×3 Eyes.’ A host of recurring characters have been added to the series over the years, but the duo of Pai and Yakumo have always been the heart of the story. Yakumo is inexorably tied to the immortal Pai as her ‘Wu’ (protector); however, her quest to become human is fraught with demonic creatures who want to gain immortality for themselves. “3×3 Eyes Gengaten” is the largest retrospective exhibition of Yuzo Takada’s work to date and features more than 200 original pieces from the series. The majority of the wall space in the Seibu Gallery is dedicated to Takada’s carefully rendered colour paintings, which were used for ‘3×3 Eyes’ magazine covers, title pages, calendars, and video games. It’s a satisfyingly thorough collection of Takada’s work. Everything is nicely spaced out and organised in chronological order, giving viewers a clear thread to follow the evolution of his style. 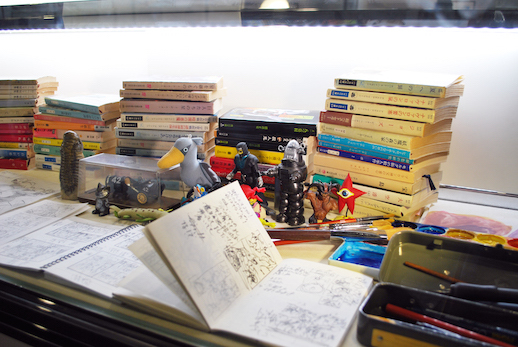 For a limited time, visitors can also see the original pages of the very first manga. In its opening scene we see Yakumo Fujii, the ordinary high school protagonist, meet Pai, the mysterious 3-eyed girl from a dying race called the Sanjiyan. Right from the beginning, the confidence of the series’ mythology gave it an epic sense of adventure. The creative process of a manga artist is rarely open to the public, so it’s a treat that Takada himself is participating in live drawing events throughout the exhibition’s run. On opening weekend the artist was hard at work at the gallery, inking a page from the latest chapter of ‘3×3 Eyes’ (the as-yet unfinished ‘Kiseki no Yami no Keiyakusha’). Although it wasn’t scheduled to be an interactive event, Takada was able to multi-task, inking and chatting away with enthusiastic members of the crowd. The attendees showed their appreciation when it was time for him to wrap up the event. But it was Takada who wanted to have the last word, thanking the audience for following his work and these characters for 30 years. “I really appreciate it,” he concluded. The influence that Takada has had on other artists can be seen from the congratulatory message boards hung up around the entrance, from the likes of fellow Kodansha Manga Award winner Norifusa Mita and younger comic artists like Tomohiro Shimoguchi. Retrospective shows can easily get lost in nostalgia, but it’s clear from this exhibition that Takada is intent on looking forward as much as he’s looking back. “3×3 Eyes Gengaten” runs until the 22nd of January at the Seibu Gallery in Ikebukuro.